Working at a running store for several years gave me a new appreciation for how your feet can affect your life. 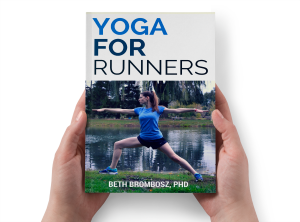 Yoga poses that act as foot stretches are fantastic for runners, especially runners training hard and/or running high mileage. Foot stretches are also great for people who have sore, tired feet and need to increase foot flexibility and stimulate blood flow, especially you ladies who love your high heels. These four yoga poses will help you stretch out your feet and keep them happy. Hold each one for up to a minute or for whatever duration is comfortable. Disclaimer: I am a yoga teacher, but I’m not your yoga teacher. Always practice yoga mindfully and if you have any questions, consult with your teacher. Also, if you’re having severe foot pain, please consult a medical professional. If you’re under the care of a podiatrist or other medical professional for your foot pain, please consult with them before trying any of these yoga poses. It’s so, so important to show your feet some love. We spend a lot of time on our feet, and often we’re wearing shoes that aren’t very supportive. (That’s particularly true and you have very high arches. That’s why I have custom-molded insoles in every pair of shoes they’ll fit in.) And, we don’t spend a lot of time thinking about the mobility of our feet and ankles. So, when the ligaments and tendons in our ankles and feet become stiff and tense, we’re not doing much to counteract that. That’s often when foot pain and discomfort begin to pop up. There’s a reason why so many people love Child’s Pose: it’s relaxing and comforting (I often find my toddler sleeping like this). And, it helps us gently begin to open up areas of our bodies that are tight, like our hips or the tops of our feet. We spend so much time with our feet at least partially flexed (in an ‘L’ shape). So, it’s good to spend some time opening our feet in the opposite direction to counteract all of that flexion. Child’s Pose is a great warm up for deeper foot stretches. You get a nice, easy stretch through the top of your foot as it lies along the floor or a yoga mat. When you first come to your mat, spend some time wiggling your knees and hips to find the position that feels right in your body that day. You might bring your knees closer together or further apart, depending on what feels right. When you’re ready to deepen the pose or feel more of a stretch through the tops of your feet, try sinking your hips closer to your feet as you warm up and settle into the pose. This foot stretch flexes the foot through the heel and helps stretch through the heel and Achilles tendon. You may also feel a stretch through the calf, too. Place a yoga strap around the ball of your foot and gently pull on the ends of the strap. Don’t have a yoga strap? Try a belt, scarf, long towel, or whatever you have handy. Try to keep your spine tall like you would in regular staff pose. As you feel the backs of your calves and ankles start to open, you can pull on the strap a little more, intensifying the stretch. Just find a spot that feels right to your body and take several full breaths. If you’re looking for a similar stretch to this one, you can always come into regular old Downward Facing Dog, too. Down Dog is a great way to stretch through your calves and the backs of your ankles. Try slowly and gently peddling your legs, pressing one heel down toward your mat, then the other. You should feel your calf muscles start to loosen, which are directly connected to tendons that attach to your heel. And, it helps lengthen some of the ligaments in your ankle, too. When those tendons and ligaments get too tight, they can begin to pull on other tendons and ligaments in your feet, causing even more problems. So, don’t forget to give your calves and ankles some love, too! Toe stretch is a great foot stretch for the plantar fascia. Anyone who’s had plantar fasciitis (like me!) can tell you how painful it can be. Keeping your plantar fascia stretched out will help keep you from developing the nasty, painful condition. For this pose. you curl your toes under and sit back onto your heels. This can be a pretty intense foot stretch, so I only hold the pose as long as is comfortable, but I’ll hold the pose a couple of times, resting my feet and ankles in between. You can also come to Child’s Pose as a counter pose, lengthening the tops of your feet. Trying this pose and it feels like too much? You have a couple of options to modify. First, if you’re really feeling it in your knees, you can place a blanket between your heels and your hips. You can also place a folded blanket directly beneath your knees for extra support. And, you could place a blanket or rolled up yoga mat under your ankles for extra support if you need it. There are plenty of options to help you find the right version of this pose for your body! Here, I’m modifying the pose by sitting on a yoga block because it’s a nice, firm support for my hips. But, a folded blanket could work, too. Again, I hold this intense stretch for as long as I’m comfortable, doing multiple rounds of the pose when my feet need some extra stretching. Need extra help working through these yoga poses? I’ve got a video that can help! It’s short (13 minutes), so it won’t take up too much of your busy day. And, it’s a great way to work on building mobility in your feet and ankles. Check it out! When you’re done, be sure you subscribe to the Sublimely Fit YouTube channel! Great stretches! Can you do a video pretty please?!! I’d love to pretend I’m working out right along with you!!! The “Toe Strech” pose is pretty awesome along with hero pose for my PF. I also like reclining hero, but I need a bolster for support. It does stretch my knees, and I get nervous that I might be over extending, but so far so good. I have had a lot of problems with my feet over the past couple of years. I do a lot of foot stretches, but I can’t do broken toe pose anymore–it really aggravates my left big toe. 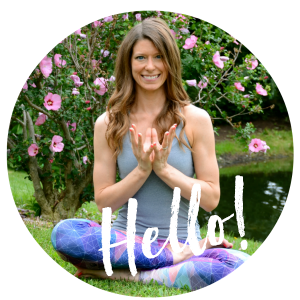 My favorite is reclined hero pose–a great stretch for my feet and my quads and a backbend! After my running assessment I have a new importance on stretching my feet and ankles. My range of motion WAS unbelievably very small. Up until recently, I had never thought about stretching my feet as part of my overall post-run routine. I have no idea that feet needed that kind of TLC. Pinning this to make sure I never forget! toe stretch is so killer for me – hurt every time – which is how i know i need to keep doing it! These are so great! We definitely neglect our poor feet. They need so much TLC!